A postcard depicting theodore Roosevelt Dam in Roosevelt, Arizona. 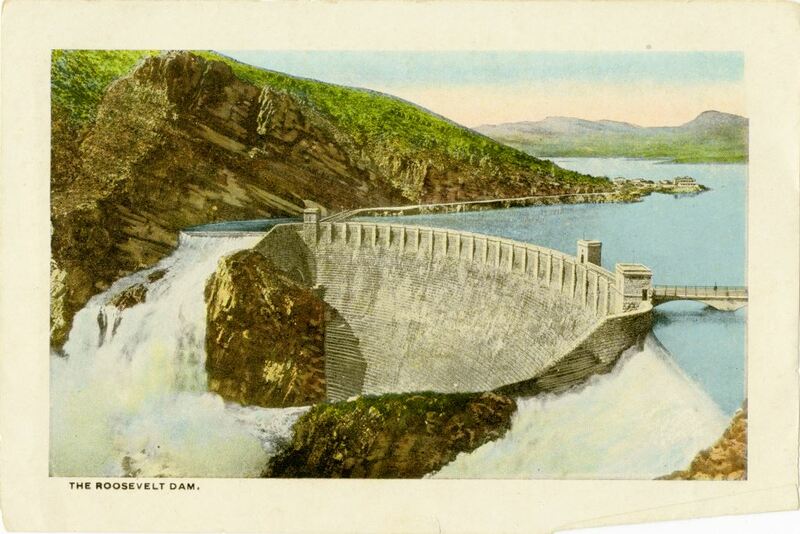 The dam was constructed by the Bureau of Reclamation of the U.S. Department of the Interior between 1903 and 1911. Located on the Salt River, the Roosevelt Dam is part of the Salt River Project and creates Theodore Roosevelt Lake. Original 6 x 5 inch color postcard: ACC# SM-00-243, file folder 1 (U.S. blanks), box 10A, Lucile (Mary Lucile) Campbell Collection, UCF Public History Center, Sanford, Florida. "Salt River Project." Bureau of Reclamation, U.S. Department of the Interior. http://www.usbr.gov/projects/Project.jsp?proj_Name=Salt%20River%20Project. 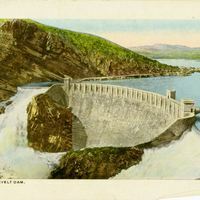 “Roosevelt Dam Postcard.” RICHES of Central Florida accessed April 25, 2019, https://richesmi.cah.ucf.edu/omeka/items/show/6748.